The Friends of Historic Riverside Cemetery (FHRC) is pleased to announce an ambitious, year-long plan to inventory and assess the condition of Riverside, with a focus on establishing priorities for the preservation and restoration of the cemetery as well as defining opportunities for increasing public awareness and engagement. Riverside Cemetery is Denver’s oldest and most historic, and its condition is a cause of concern for many in the community, including historic preservationists, western and art historians, and those with family members buried there. As Denver celebrates the 150th anniversary of its founding in November of 1858, we believe it is important to develop a plan for the resting place of so many of the city’s pioneers. This assessment program is the first step in a long-term initiative; we see it serving as the foundation for the future preservation and restoration of Riverside. Once the comprehensive audit is complete, we will build our set of priorities moving forward. The plan will continue a number of elements, including structures, monuments, trees, roses and horticulture. A major component of this project is the monument documentation project. Picking up on what a team from the Heritage Foundation started (thank you Sue, Maria, and Jayne! ), we are planning to have all the grave markers documented and photographed by the end of 2009. The program officially kicked off on Saturday, October 25th, (in conjunction with the Fairmount Heritage Foundation) with a program organized by an enterprising Eagle Scout candidate, Michael Funk, who organized over 20 volunteers to inventory block 26. Michael and his volunteers were given two hours of orientation and training before going into the field to begin. Riverside is thankful to have access to the talent, energy and knowledge of Jayne Uhlir and her years of experience training volunteers. Once the training was complete, the volunteers will broke into teams who documented the text on each stone, measured its dimensions, noted the material and its overall condition. Many of the stones at Riverside are quickly losing detail from natural weathering and pollution, which is one reason why creating a digital record is so important. We are going to be putting together more training sessions in the future; we’ll also be looking to assemble some volunteers to document and map the viable and the not-so-viable trees, roses, and other horticulture. Please let us know if you would be interested in participating by sending an email to friends@friendsofriversidecemetery.org. 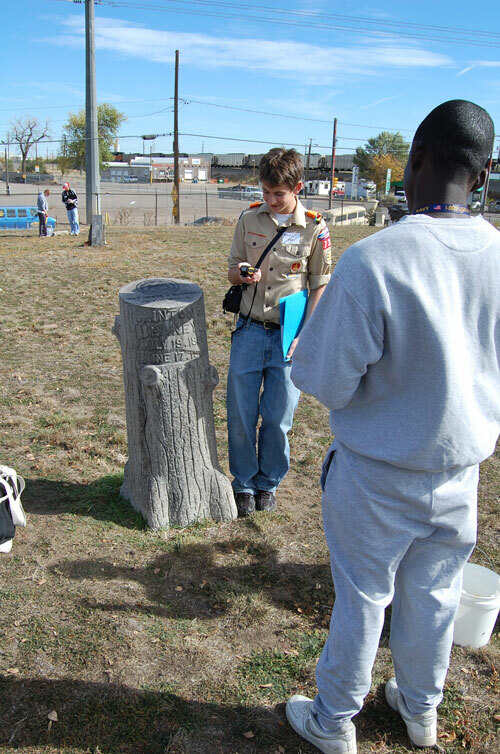 Michael Funk help a teammate find the GPS coordinates of a monument at Riverside.